Our morning departure for half day winter wildlife safari. Our afternoon departure for a half day winter wildlife safari. Go in search of animals in their wintertime habitats on this wildlife tour from Jackson Hole. You'll explore the areas around Grand Teton National Park and the National Elk Refuge to look for elk, bison, bighorn sheep, foxes, coyotes, deer, waterfowl, bald eagles, moose, and maybe a wolf, stopping for plenty of photo ops. Along the way, hear about the ecology and history of this alpine region. You will begin this wildlife photo tour with pickup from your centrally located Jackson Hole hotel or residence. After pickup you will head north along the western boundary of the National Elk Refuge to Grand Teton National Park. Here you will travel along the southern park roads watching for wildlife in their natural habitat and stopping frequently for photo-ops. You will see places like Antelope flats, home to historic homesteads and free ranging herds of bison and pronghorn. Your guide will also show you the Moose-Wilson road famous for abundant flora and fauna. Wildlife you will frequently encounter on this trip includes bison, elk, deer, moose, pronghorn (aka antelope) fox, coyote, bear, bald eagle, trumpeter swans, and if you're lucky wolves. If time allows your group might choose to stop at the Jackson Visitor Center or the new moose visitor center in Grand Teton National Park. The route varies seasonally based on group interest, road closures and wildlife migration. We had a wonderful experience seeing the wildlife and learning about the Grand Tetons. Our guide, Grant, was excellent. We saw Moose, Mountain Sheep, Coyote, Elk, Black Tail Weasel and Bison. A perfect way to spend a day away from the slopes. 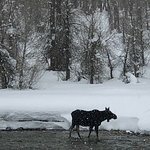 Get quick answers from Winter Half-Day Wildlife Safari From Jackson Hole staff and past visitors.